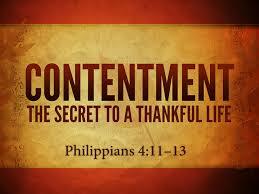 I have learned in whatever situation I am to be content (Phil 4: 11). There’s a place for legitimate discontentment. All of us should, to some degree, be discontent with our spiritual growth. If we aren’t, we will stop growing. There’s also what we might call a prophetic discontentment with injustice and other evils in society, coupled with a desire to see positive change. But there’s also a sinful discontentment that negatively affects our relationship with God. It can easily lead to resentment or bitterness toward God or other people. Whatever situation tempts us to be discontent, and however severe it may be, we need to recognize that discontentment is sin. We’re so used to responding to difficult circumstances with anxiety, frustration, or discontentment that we consider them normal reactions to the varying vicissitudes of life. But that just points out the subtleness and acceptability of these sins. When we fail to recognize these responses to our circumstances as sin, we’re responding no differently from unbelievers who never factor God into their situations. We’re back to our ungodliness as the root cause of our sins. The truth of David’s words in Psalm 139: 16 — “In your book were written, every one of them, the days that were formed for me, when as yet there was none of them” — can help us (and does help me) deal with the circumstances that tempt us to be discontent. Whatever your circumstances, and however difficult they may be, the truth is that God has ordained all our days — with all their ups and downs, blessings and disappointments — as part of His overall plan for your life. God does nothing, or allows nothing, without a purpose. And His purposes, however mysterious and inscrutable they may be to us, are always for His glory and our ultimate good. Bridges, Jerry (2014-02-01). Holiness Day by Day: Transformational Thoughts for Your Spiritual Journey (p. 126). NavPress. Kindle Edition. the mind in an elevated sum.